The camera drifts above endless miles of mist-shrouded forest, following the meandering course of an old river. The soundtrack is rich with the sounds of birds and other wildlife. Then, as it rises over a tree-covered ridge, a different view opens up before us: what looks like an obliterated landscape stretching to the horizon. We may be reminded of images we’ve seen of the devastated Amazon region, but this is not the tropics. We are flying above Canada’s northern boreal forest, over the Athabasca River basin, towards Fort McMurray. and below us now are the catastrophic consequences of our obsessive pursuit of oil. 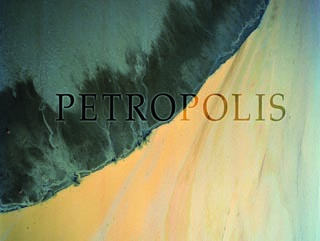 Peter Mettler’s Petropolis (2009) is not exactly a documentary, though it provides some necessary contextual information with brief pieces of text occasionally appearing over the images. Rather, like Werner Herzog’s film about the oil fires in Kuwait, Lessons of Darkness, it’s what might be seen by a space probe’s investigation of an alien landscape, something we could only hope is actually science fiction and not reality. 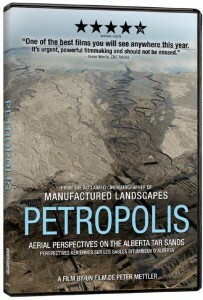 I was initially drawn to Petropolis because a couple of years ago I edited a documentary about the probable environmental and social consequences of the proposed Mackenzie Valley gas pipeline project, and the implications of such large-scale development for the pristine landscape of northern Canada. That pipeline still hasn’t received final approval from the government, but Mettler’s film presents a nasty warning of what the inhabitants of the Mackenzie Valley may be facing in the future. The tar sands are the largest industrial development in the world, destroying forests and farmland, draining and polluting the world’s third largest watershed, the Athabasca basin. While the area contains the planet’s second largest reservoirs of petroleum, this comes in the form of bitumen, basically thick sludge mixed with sand. It must either be gouged from the earth in vast strip mines which have ripped away huge tracts of boreal forest and arable land, or else liquified by pumping superheated steam into the ground to make it possible to draw the thick oil out. The absurdity of this development lies in the fact that, not only is it devastating tens of thousands of square kilometres of environmentally valuable land, but in doing so it is consuming enough energy to power several large cities and draining the Athabasca Basin of the clean water which supplies much of the north. In fact, much of the natural gas which is supposed to flow down the Mackenzie pipeline will be destined for the tar sands – one resource being depleted in order to produce another, the whole process creating massive levels of pollution even before the resultant oil will be burned to produce even more greenhouse gases. This damage to the environment is irreparable, a clear indication of just how deranged our dependance on oil has become: we are willing to squander all these resources, all this energy, in order to have a few more years of non-renewable oil to run our cars. But while this is all the subtext of Mettler’s film, the substance is aerial images of the impact already made on the landscape. 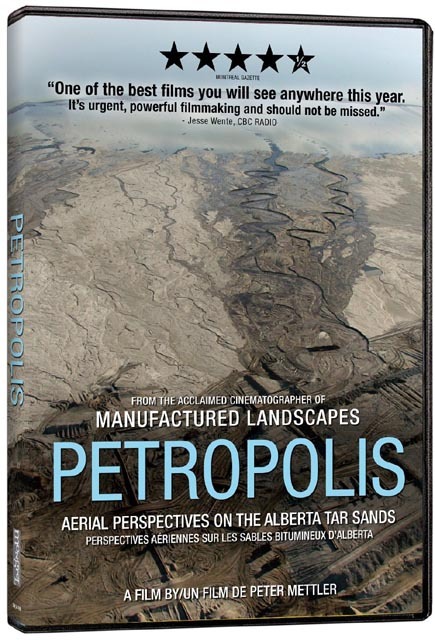 Mettler is one of Canada’s finest cinematographers – he shot Jennifer Baichwal’s equally beautiful/appalling documentary Manufactured Landscapes – and here he provides a montage of long, flowing shots looking down at the tar sands as if from an orbiting probe, his lens tracing the almost abstract patterns of destruction in ways which at times seduce us with a sense of aesthetic beauty before we realize once again just what we are looking at. For what we are actually seeing is a kind of gigantic corpse which has been ripped apart and scattered, left putrid and rotting to be scavenged by men in huge machines who seemingly have lost all respect for the planet they live on. It’s devastatingly clear that this place can never be repaired or restored – and with only a fraction of the sands so far exploited, the disease is going to continue spreading. Eventually this process will leave an oozing, poison-filled scar the size of England. It’s obvious from what we see that the occasional small fines levied against the oil companies for acts of environmental damage are merely camouflage to disguise corporate, government and societal complicity in this process, like punishing a child for spilling paint on the floor as he burns down the house. At the end of the film, the camera begins to retreat from this alien landscape, pulling back over still pristine tracts of northern forest. A reminder of what has been lost and what there is still left to lose, if nothing is done to alter course. This entry was posted in Review and tagged Digital Video, Documentary, DVD, Jennifer Baichwal, Oil, Peter Mettler. Bookmark the permalink.